Fresh Spring Trio Instagram Giveaway! Hooray! Finally, blue skies, softer breezes and warmer air are on the way here in the Northeast. Can’t come a moment too soon. 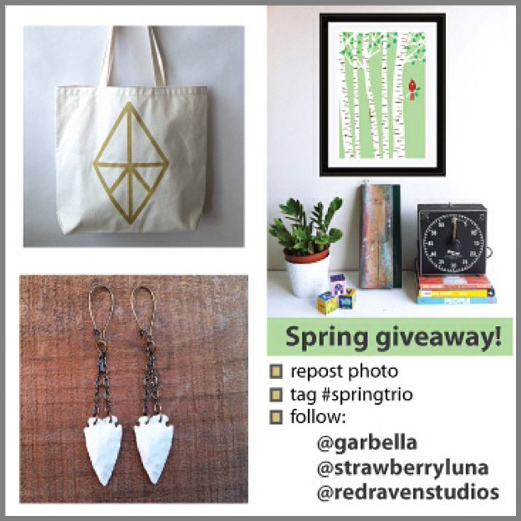 To celebrate 2 of my super talented and fellow Pittsburgh artist friends garbella + Redraven Studios & I strawberryluna have teamed up to bring you a special welcome-to-spring-giveaway on Instagram! We are giving away all 3 of the above items: Diamond Tote Bag (by garbella), Spring Cardinal print (by strawberryluna), and Arrowhead Earrings (by Redraven Studios) to 1 lucky winner! Repost the above photo on Instagram. You can screencap it to repost. And follow all 3 of us on Instagram: @redravenstudios + @strawberryluna + @garbella. We will choose a winner at random on Saturday morning (the 23rd of March) and announce the winner on Instagram with a special photo shout out from all 3 of us.